Purplebricks are pleased to offer this modern semi detached house, situated on the new development of The Orchards, within easy reach of Evesham town centre. This well designed three bedroom home is available with no onward chain. The location offers a delightful setting which is surprisingly open and impressive for a private new development. Nestled in the heart of this development, this semi detached home benefits from ample off road parking spaces and a very well proportioned accommodation. As you enter the property you are initially greeted with a welcoming hallway and useful downstairs WC before discovering the ample living room to the rear of the home, with neutral fresh décor and enjoying a dual aspect with French door leading to the garden as well as a low level side window creating an lovely natural light and feeling of space. To the front of the ground floor is a sensibly sized kitchen/breakfast room, adequately proportioned to allow for a breakfast table and comprehensively fitted to incorporate contemporary modern wall and base units creating ample space for appliances and having an integrated gas hob, cooker and matching hood. Coordinated beautifully with vinyl flooring. 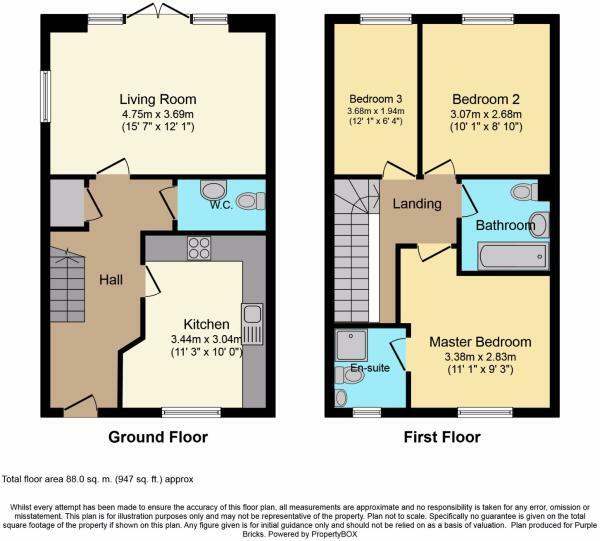 Upstairs will uncover two generous double bedrooms plus an adequate single which are more than capable of supporting the needs of a growing family and a comfortable sized, contemporary modern family bathroom and contemporary en suite with shower cubicle. The rear of the property benefits from a private, fenced, lawned rear garden which offers the benefit of a blank canvass for the new owners to impose their mark, with paved terrace and rear hardstanding - ideal for a hot tub! And useful gated side access. This property benefits from a bright, neutral décor, its fully carpeted throughout with gas central heating and fully double glazed and with NHBC guarantee remaining. Disclaimer - Property reference 626584-1. The information displayed about this property comprises a property advertisement. Rightmove.co.uk makes no warranty as to the accuracy or completeness of the advertisement or any linked or associated information, and Rightmove has no control over the content. This property advertisement does not constitute property particulars. The information is provided and maintained by Purplebricks, covering Central England. Please contact the selling agent or developer directly to obtain any information which may be available under the terms of The Energy Performance of Buildings (Certificates and Inspections) (England and Wales) Regulations 2007 or the Home Report if in relation to a residential property in Scotland.